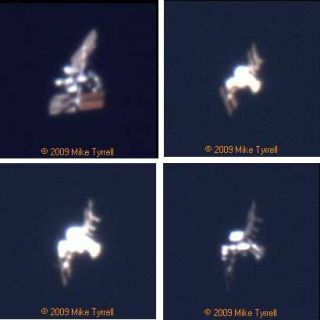 Mike Tyrrell took these still shots from video he made late last week of three passes of the International Space Station with its new solar panels. The video was shot from a telescope in a home-built observatory at the back of his garage in Northwich, about 20 miles southwest of Manchester, England. © Mike Tyrrell. Used with permission. With the Space Shuttle Discovery scheduled to undock from the International Space Station (ISS) on Wednesday, skywatchers across much of the United States and southern Canada are in for a real treat on Wednesday, Thursday and Friday evenings. Should clear skies prevail, there will be opportunities to see both Discovery and the orbiting station flying across the sky from many locations. The sight should easily be visible to anyone, even from brightly-lit cities. Already last week, skywatchers were spotting the station easily after it spread its newly deployed solar panels. Mike Tyrrell of England shot videos of the station, on multiple passes, from his garage observatory. The appearance of either the shuttle or the space station moving across the sky is not in itself unusual. On any clear evening within a couple of hours of local sunset and with no optical aid, you can usually spot several orbiting Earth satellites creeping across the sky like moving stars. Satellites become visible only when they are in sunlight and the observer is in deep twilight or darkness. This usually means shortly after dusk or before dawn. Shuttle Discovery is expected to undock from the ISS at 3:53 p.m. Eastern Daylight Time on Wednesday. Discovery will fly around the ISS before finally pulling away from the Station at 5:37 p.m. EDT, although it should still remain at a relatively close distance to it until its scheduled return to the Kennedy Space Center in Florida on Saturday, March 28. Both vehicles will be traveling across North America near the most northerly part of their respective orbital trajectories that is taking them directly over latitude 51.6-degrees N.
Appearing as a pair of very bright stars, the ISS should appear as the noticeably brighter object and will be leading Shuttle Discovery as they move across the sky. While the ISS looks like a moving star to the unaided eye, those who have been able to train a telescope on it have actually been able to detect its T-shape as it whizzed across their field of view. Some have actually been able to track the ISS with their scope by moving it along the projected path. Those who have gotten a good glimpse describe the body of the space station as a brilliant white, while the solar panels appear a coppery red. Traveling in their respective orbits at approximately 18,000 mph (29,000 kilometers per hour), both should be visible from about one to four minutes (depending on the particular viewing pass) as they glide with a steady speed across the sky. Because of its size and configuration of highly reflective solar panels, the space station is now, by far, the brightest man-made object currently in orbit around the Earth. On favorable passes, it can appear as bright as the planet Venus at magnitude -4.5 and some 16 times brighter than Sirius, the brightest star in the night sky. During this current mission, astronauts have deployed the space station's final set of solar arrays and based on recent observations they have made the ISS appear even brighter; some have made estimates as bright as magnitude -5 or -6 (one and a half to 4 times brighter than Venus!). And as a bonus, sunlight glinting directly off the solar panels can sometimes make the ISS appear to briefly "flare" in brilliance. Each will ask for your Country, City or a zip code, and respond with a list of suggested spotting times. Predictions computed a few days ahead of time are usually accurate within a few minutes. However, they can change due to the slow decay of the space station's orbit and periodic reboosts to higher altitudes. Check frequently for updates. Generally speaking, the shuttle-ISS tandem will be visible across southern Canada and the northern and central United States. Locations that are situated above latitude 40-degrees north, will be able to partake in at least a few of the Wednesday/Thursday/Friday evening viewing opportunities. New York and Salt Lake City, for instance, will have three opportunities with the duo getting as high as roughly one-quarter of the way up from the horizon to the overhead point (called the zenith). As one heads farther north, the number of sighting opportunities increase and viewing circumstances improve. Across southern Canada, at least four and in some cases as many as five opportunities to see the shuttle and space station will occur for most cities. Indeed, for cities such as Vancouver, Calgary, Edmonton, the two space vehicles will be available twice on consecutive nights (either Wednesday-Thursday or Thursday-Friday). And their tracks across the sky in most cases will be much higher: as high as 72-degrees from Montreal, 77-degrees for Vancouver and 84-degrees (practically overhead) for Winnipeg. Between roughly 35 and 40-degrees north latitude, however, the viewing options become much fewer, perhaps only one or two chances at best, with sky tracks no better than 10 or 15-degrees above the horizon. Washington, D.C., Philadelphia and St. Louis have two chances; San Francisco, Oklahoma City and Virginia Beach get only one chance. Meanwhile, localities below roughly latitude 35-degrees north are out of luck, with the shuttle/ISS tandem not rising higher than 10-degrees above the horizon; too low to be considered favorable for viewing. For Europe, viewing circumstances will mirror the conditions for Canada and the northern United States, although Discovery and the ISS will still be docked on Wednesday evening (Greenwich Time) and will thus appear as a singular moving star, but they'll be two separate objects on Thursday and Friday. In the Southern Hemisphere, Australia's New South Wales, Victoria and Tasmania are favored with a few passes on Thursday, Friday and Saturday, but in the early morning hours before sunrise. The same holds true for New Zealand. For much of South America the shuttle/ISS tracks are unfortunately too far to the south for good visibility, but for southernmost Chile and Argentina (Patagonia) as well as the Falkland Islands, Discovery and the ISS should be readily visible before sunrise on Thursday, Friday and Saturday. Again, keep in mind again that once undocked, Discovery should appear to trail the space station as they track across your sky. On Wednesday evening, they will be separated by only about a half-degree (the apparent width of the moon). By Friday evening, the distance between them will have widened to nearly 10-degrees; the ISS will be leading Discovery across the sky by almost a half-minute.